“Masarap kumain ang mga taga-Cavite,” we were told and we were ready to discover the city's delicious eats. To most, the Cavite we know is one from our history books: it is the province known as the “cradle of the Philippine revolution” and is the backdrop for the Philippine Declaration of Independence in 1898. Cavite City also served as a port for the Manila Galleon trade, directly influencing the food served in Cavite homes and the dialect you can still hear being spoken by elders around the province. “Masarap kumain ang mga taga-Cavite,” Edwin Guinto, Cavite local and our designated tour guide warned us but we were prepared to eat. On our eat-inerary: kakanin, pancit, and unique Cavite finds. 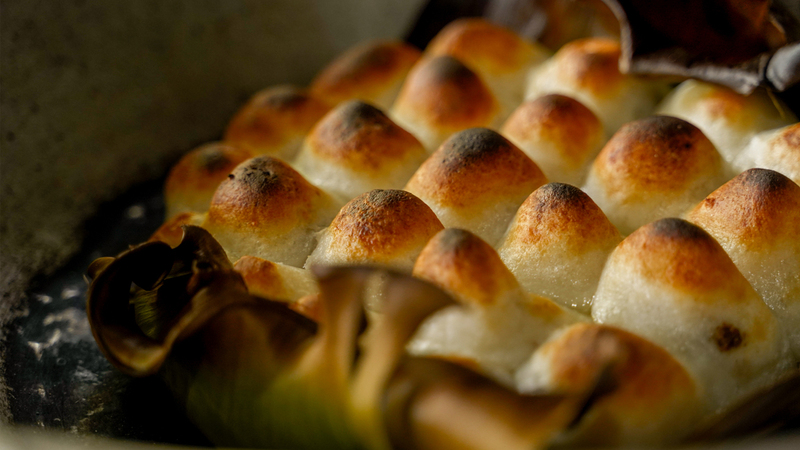 Bibingkoy is a kakanin that fuses buchi, bibingka, and ginataan all in one sticky delicious plate. If you start your day early in Cavite, make sure to begin at the Cavite Public Market. 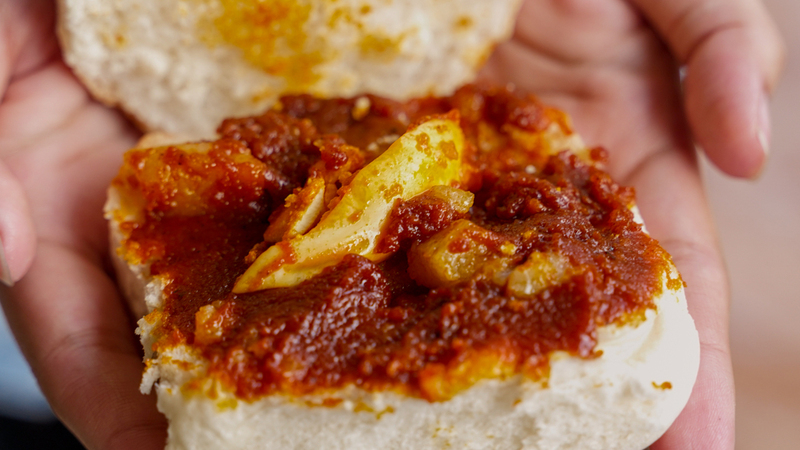 There, you’ll find Aling Ika’s Carinderia where you’ll find the hard-to-find Bibingkoy, a delicacy you can only find in this part of the country. 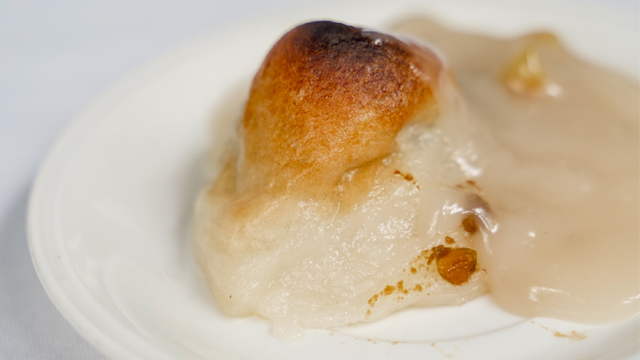 It is a kakanin that fuses buchi, bibingka, and ginataan all in one sticky delicious plate. 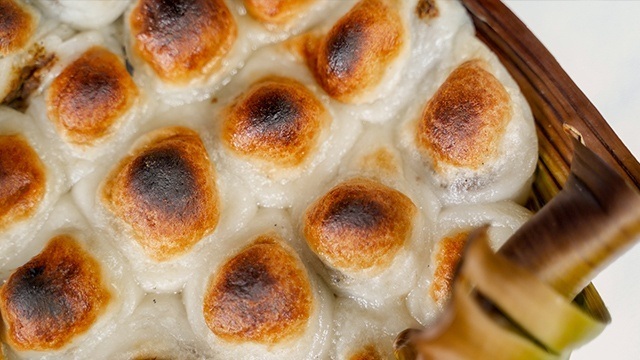 Glutinous rice dumplings are filled with sweetened boiled monggo beans and is cooked pugon-style with heat on top and at the bottom. 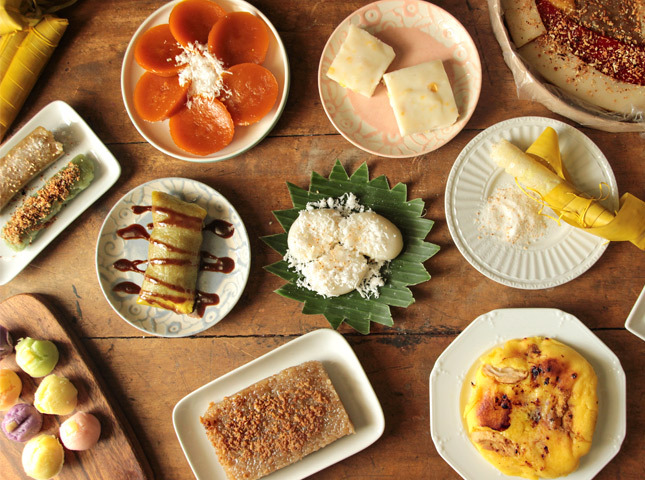 It is topped with a rich sweet sauce made with coconut cream, sago, and langka (jackfruit), and is poured over the Bibingkoy before eating. Her shop runs out of food before noon rolls in and she goes home to rest before prepping for another day of making delicious Bibingkoy. 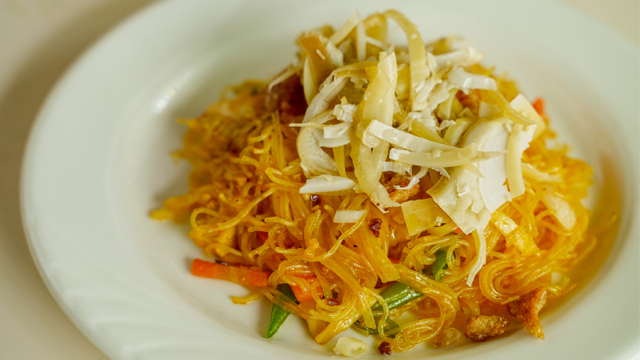 Pancit is also popular in Cavite, a big influence from the Chinese merchants that settled in the province. 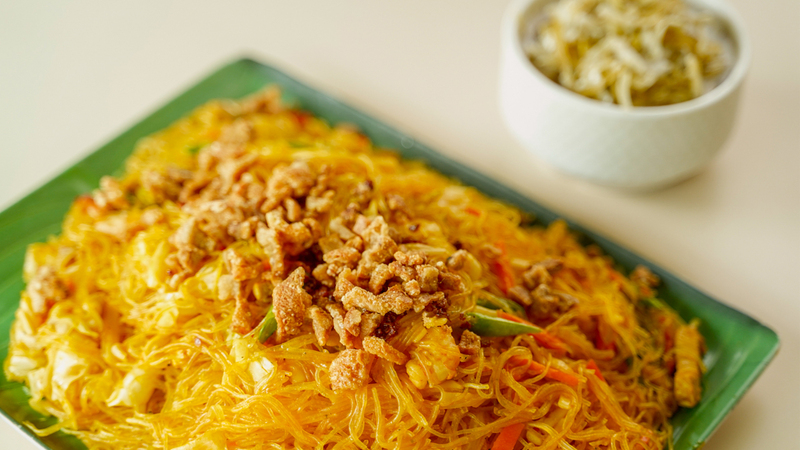 Pancit is also popular in Cavite as the province was largely influenced by the Chinese merchants that settled in Cavite. 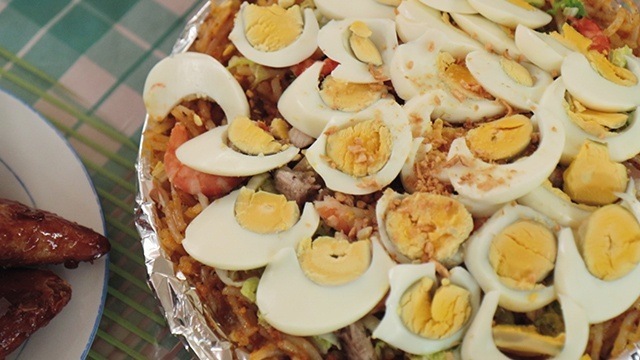 Pancit Puso is your basic sotanghon guisado, but it’s topped with puso ng saging (banana blossoms) which is boiled in vinegar as a condiment, instead of calamansi. 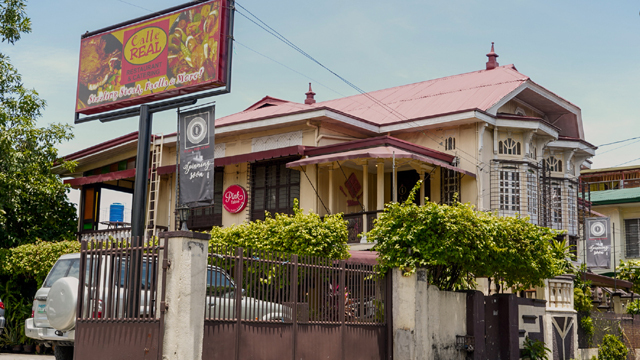 Asao Grill and Restaurant in Cavite City has been serving Pancit Puso since 2001. 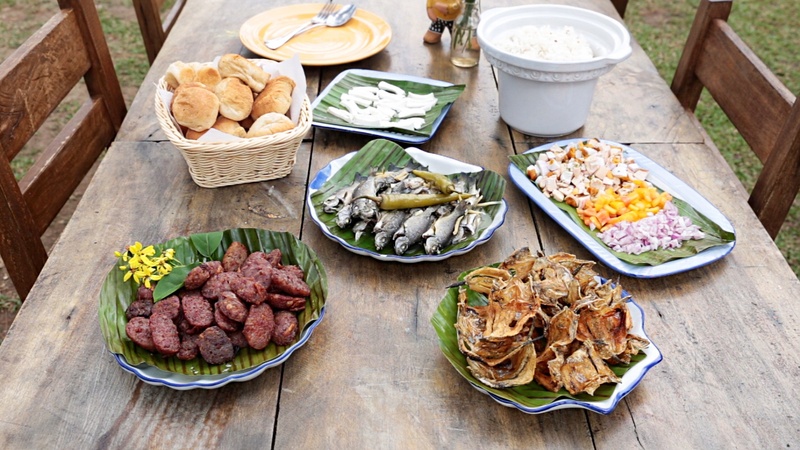 One unique thing about Cavite cuisine is their concept of “terno-terno” or what they consider to be the “perfect pairing”. It is not enough to have one dish on the table. Instead, other dishes are served which each other to create perfect flavor pairings: nutty kare-kare is paired with salty adobo sa dilaw and sour kilawin sa papaya. This spread is usually served during Sunday lunches, one that is meant to be enjoyed with family. 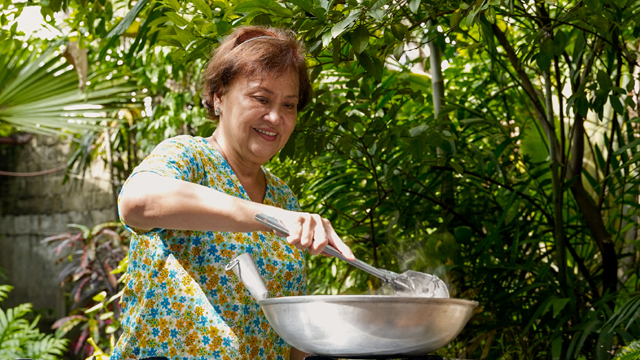 “Masarap talaga kami kumain!” laughs tita Agnes Poblete of Cantina de Tita A in Cavite City. She opened part of their home to serve lutong bahay dishes, including dishes that are ‘terno-terno” and briny delicious Pancit Pusit. “Pancit Pusit came about when there was leftover adobong pusit from lunch so it was turned into merienda,” explains our local guide Edwin. Instead of pork or chicken, squid is the meat used for this noodle dish. 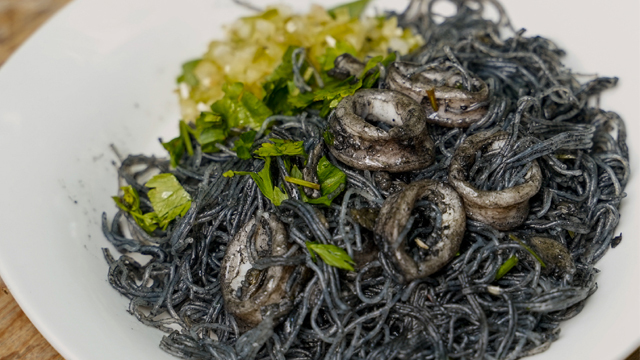 Squid ink is added to coat the noodles in a black hue, making each bite burst with flavors from the sea. 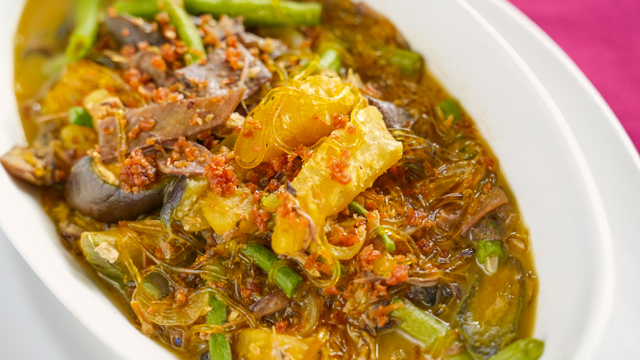 Kinchay and kamias is used to top the pancit, giving the dish its bright flavors, a perfect foil to the salty and briny flavors that envelop the sotanghon noodles. One thing you have to know about Caviteños: they love their tamales. One thing you have to know about Caviteños: they love their tamales. Usually served during Noche Buena or Media Noche, tamales is a savory and peppery delicacy, a version that is distinctly Cavite’s (different from the Mexican version that is made with dough made with corn or masa and steamed in corn husk). Cavite’s tamales is made from a dough mixed with ground peanuts, rice flour, and achuete, and steamed with pork, chicken, hard boiled eggs, and garbanzos. 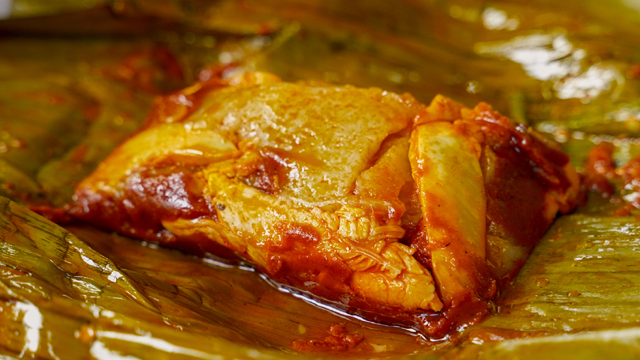 It is wrapped in multiple layers of banana leaves before it is steamed again. Ellen Guevarra Orence and Florencio “Boy” Robinson, who learned how to make tamales from his mother, have been continuing the family tradition of making labor-intensive tamales using the same recipe Caviteños enjoy. It is a hefty meal they enjoy with pandesal or even rice. 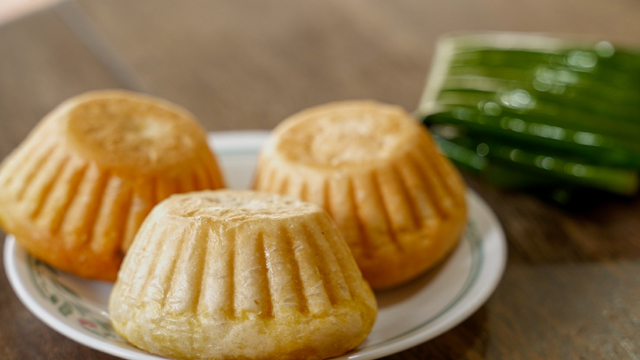 When in Cavite, one shouldn’t miss the mild fresh flavors of quesillo (kesong puti). 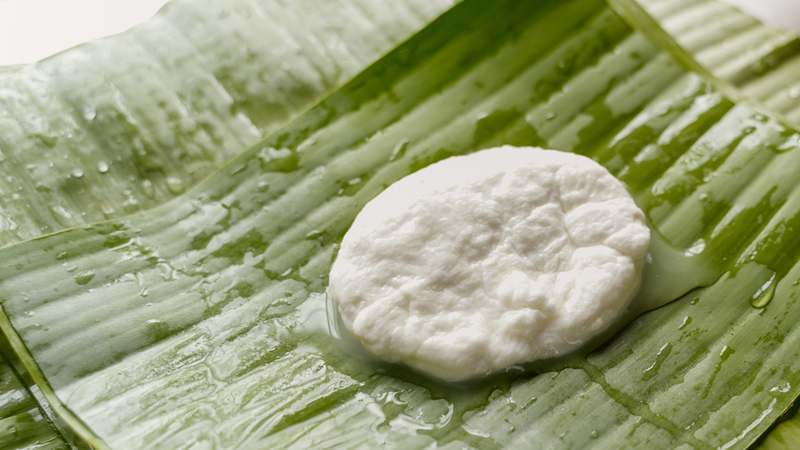 When in Cavite, one shouldn’t miss the mild fresh flavors of quesillo (kesong puti). It is simply made from fresh carabao’s milk and is abundant in General Trias, Cavite where there is a lot of carabao milk. Fresh, salty, and sweet, it is used as palaman in bread for breakfast or merienda. 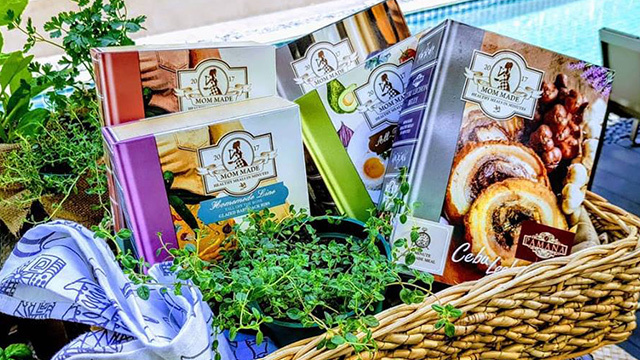 It is perfect with salakot, a soft bread you can find in Dizon’s Bakery in Cavite City, which has been churning out pugon-baked breads since the 1930s. 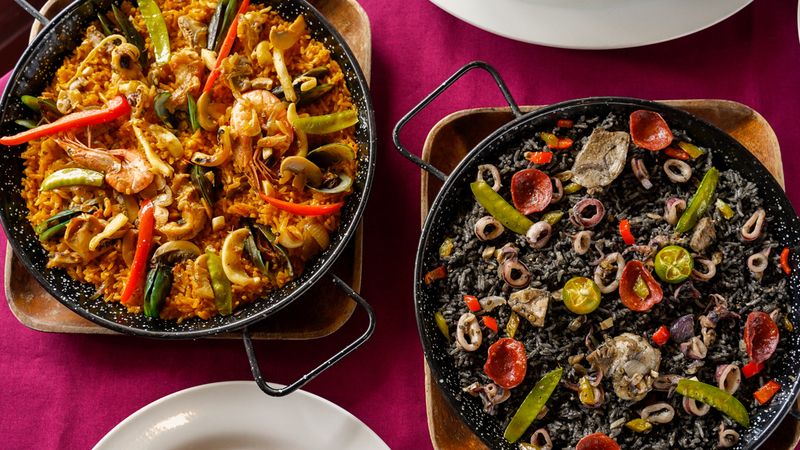 Make sure to order their hearty Beef Kaldereta, which is topped with cheese, and any of their sumptuous paella. They recently opened a section in the restaurant dubbed Plaka Poblacion, where you can enjoy listening to vinyl records while enjoying your delicious spread from Calle Real’s kitchen. 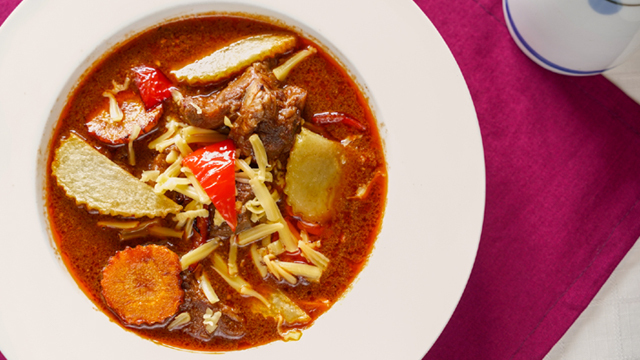 Cavite's dishes rarely make it to other cities such as Metro Manila. 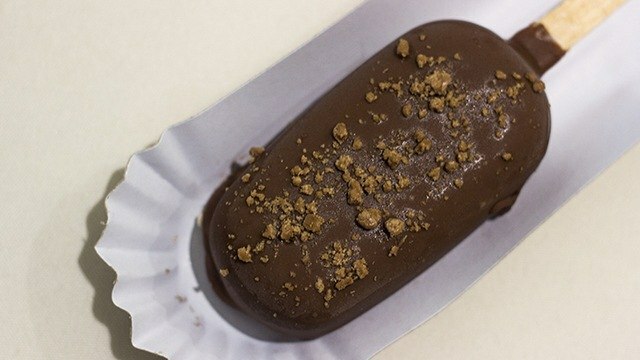 The Bibingkoy, for example, has a limited shelf life, making it difficult to introduce to other cities. Twelve hours in Cavite was definitely too short to learn about everything you need to know about Cavite cuisine. One thing was certain—and it was evident in the palengke, in restaurants, and in homes where we were welcomed—Caviteños love and celebrate their food and every meal was meant to be enjoyed with every spoonful.